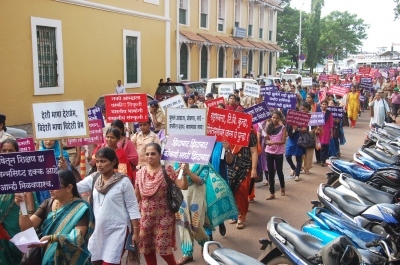 Goa News |Parsekar Formula: Don’t come on the road, get your demands solved! No dharna, no demonstration, no morcha, no public outcry. Make your genuine demand in a quiet manner and your work would be done. But if you resort to any action coming on the road, No, your demand would not be met. And this is not April Fool. Chief Minister Laxmikant Parsekar means it. He has found a new democratic formula to solve ‘genuine’ public issues. “Yes, your work would be done if you don’t come on the road”, Parsekar told the media yesterday. The first issue was of the teachers in vocational streams. Around 300 teachers got revised salaries, including single and double part-time teachers. The second issue was of government employees of printing and stationary, whose double overtime and compensatory off was reduced to one option while they work in any emergency. He restored it. While announcing both the decisions, CM said: “Let me tell you, they never came on the road shouting slogans. Demands were genuine and I solved it”, he said. According to him, the demonstrators lose sympathy (of government) through such actions while sometimes somebody (opposition) uses them and their issues. Does it mean that demands would be solved in your regime if people don’t come on the roads? Journalists asked him. Obviously, he said, adding that it does not suit the teachers to come on the road and set such examples before the students. Didn’t you ever come on the road making demands? One journalist asked him. No, not as a teacher, he replied promptly. Should a teacher pose an example by becoming politician, at the cost of educational mission? Unfortunately, this question was not asked to teacher-turned-politician Principal Laxmikant Parsekar Sir!